What B12 Deficiency Symptoms Do You Recognize? One of the most common symptoms of a lack of B12 includes numbness and tingling in the fingers and toes. This is often ascribed to diabetes in those taking metformin. While it is true that diabetes can cause this, it is also possible that a b12 deficiency is a contributing factor. Particularly in those who take metformin, which blocks absorption of B12. If someone with diabetes believes their symptoms have gotten worse, and doesn't know they have gluten intolerance, they may be able reverse the changes by using a form of B12 that they can absorb. Gait ataxia is also a common symptom of B12 deficiency. In this case, control over the normal process for walking is disrupted, causing balance problems, staggering, weaving and other issues that make walking difficult. This can become irreversible if the deficiency lasts a long time. Fatigue that looks like iron deficiency anemia can also be a symptom. Folate and B12 levels both should be checked, as if the folate is also low, but only B12 levels are increased with supplements, the low folate could still result in a form of anemia and fatigue. B12 absorption takes place in the area of the terminal ileum of the small intestine, the last section before the large intestine. Damage from gluten intolerance can disrupt the absorption of B12 in this area. This leaves only passive absorption in the intestine which can absorb about 1% of the intake. This often results in too low of a level. Those with celiac disease often have B12 deficiency symptoms, since they cannot absorb it through the intestine in sufficient quantity, at least not until the small intestine has healed.. 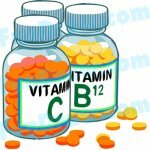 Anyone taking certain medications like antacids, Tagamet and other H2 receptor antagonists, Metformin for diabetes, gout medicines, potassium supplements, anticoagulants, cholesterol lowering drugs, and proton pump inhibitors (for acid reflux) are even more likely to be deficient as these drugs interfere with the absorption of B12. Your pharmacist may be able to advise you if your medication is one that does so. this page at a better price than local stores. It is also available at Sprout's Farmer's Market in my area. Pernicious anemia is associated with B12 deficiency because a substance called intrinsic factor, which is produced by the parietal cells in the stomach, is needed for absorption of B12. If you are deficient in intrinsic factor, you won't be able to bind and absorb B12 in the intestine. Infection with H. Pylori can also cause chronic stomach inflammation and make the parietal cells unable to produce the intrinsic factor. Once the intrinsic factor and B12 form a bond, the small intestine normally has receptors that will take it up. Calcium from the pancreas is a necessary element for the bonded B12 to be taken up. So pancreatic insufficiency or small intestine damage will hinder the uptake. The autoimmune illness Pernicious Anemia that causes antibodies to attack the parietal cells gradually makes the intrinsic factor unavailable. There may be a genetic cause for the antibody problem. Of those with this condition, about 20% of their relatives will also have this same autoimmune problem. If you have Pernicious Anemia, the shots or oral supplementation will be necessary for the rest of your life. In celiacs, until the small intestine is healed, the sublingual form of oral supplementation will be necessary. If you have B12 deficiency symptoms, please see your doctor to be tested. So many symptoms are reversible with just taking B12 shots or sublingual lozenges. Prescription for Nutritional Healing, Phyllis A Balch, CNC, C 2000.